Ok, here goes. I call them 'my disasters', but I also recognise that although these paintings did not turn out as I had intended, they each taught me something important about painting with watercolour. I hope that by sharing with you the objectives and lessons from each of these 'failed' attempts, I will help you to be more positive about your own 'failures'. I tend to put the word 'failure' in quotes because, if we learn from each one, then the creation of the painting was anything but a failure. Subject: A road I drive along every day is lined with trees on both sides. In the early Autumn some trees were golden brown, yet others were still summer green. They blended naturally one into the other and made a beautiful sight. Object: An exercise in painting trees and I thought I could capture the blending by adding browns while the greens were still wet. Lesson Learned: It worked .... but not how I intended. Also trees are harder in groups, than they are individually. 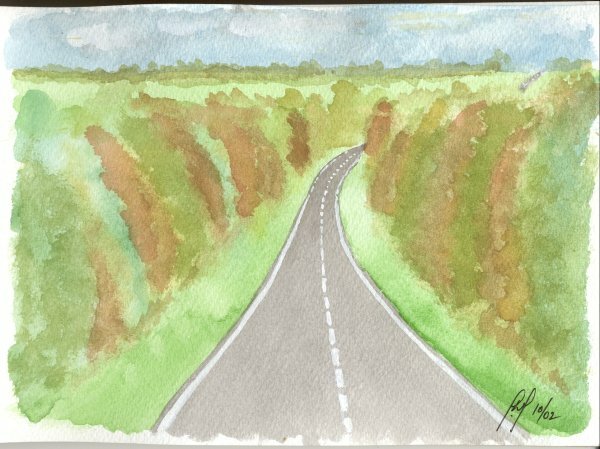 Positives: The road runs downhill from where I was standing, and	sweeps round to the right before climbing again. I captured the impression of being at a high point by allowing the viewer to see over the treetops. Subject: A sunset. A beautiful photograph seen in a book. Objective: To experiment with a night time scene, and try to capture the redness of the sky reflecting on the surface of the water. Lesson Learned: I am not good enough to be too clever - yet. 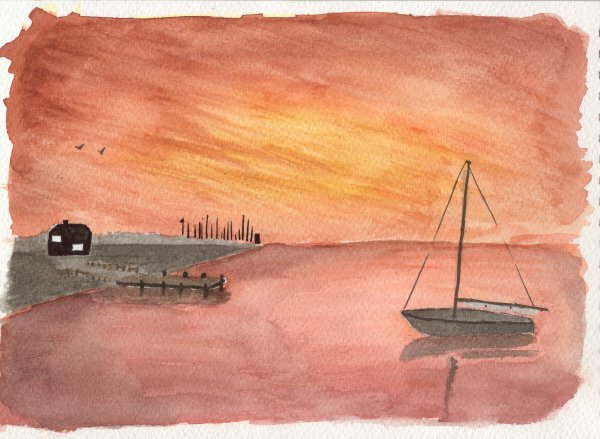 I still don't know how to do a red sky, but I have learned how NOT to do one. Silhouettes, no matter how black they may look to us in real life, are NEVER black. They are dark grey. When painting reflections, don't forget that up becomes down, and left becomes right .... the mast of the boat is leaning the wrong way in the reflection. Positives: The boats reflection is not too bad, and the birds look good. Subject: A Scottish piper from a photograph in a book. The background is fictitious. Objective: To experiment with painting people. I felt ready to try something different ... I was wrong! Lesson Learned: I cannot draw people. I have also established through other similar experiments that I cannot draw animals. You will see NO people or animals in any of my paintings ... but I'm working on it. 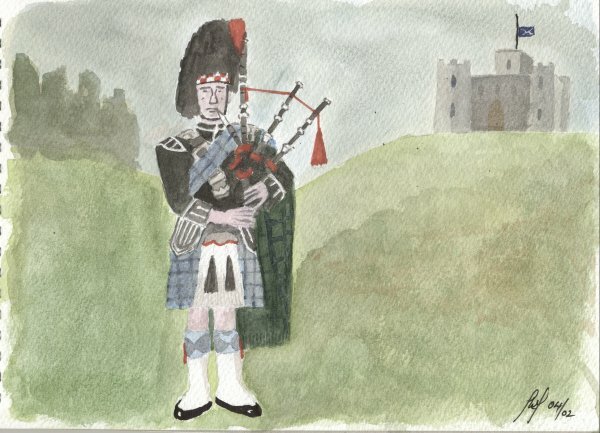 Positives: I have "proportions" and "perspective" fairly well defined, because I have made it obvious that the piper is in the foreground, the trees in the middle ground and the castle in the distance. I have also shown each to be at different heights. 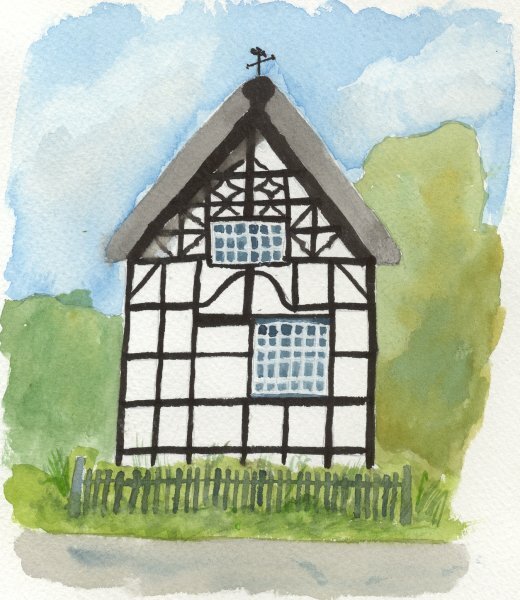 Subject: Copied from a photograph of a country cottage. Objective: Can't remember - just to create a nice painting I guess. Lessons Learned: Lots!!! Perspective is important. Painting the house full-on without including it's sides, has left me with only 2 dimensions with which to work. It has created a flat and uninteresting subject. Lines do not need to be straight ..... but they sure need to be upright. The human eye seems to accept a slightly wobbly line as being straight, even when it isn't - but if a line that is supposed to be vertical, is even a degree off true, it stands out like a sore thumb. Avoid going over the sky a second time .... it becomes very blobby. Trees are harder than they look. Positives: None. With this one I am at a loss to see ANYTHING positive ... other than I learned a lot. So there you have it. There are many more 'disasters' where they came from and I will be adding more here as time permits. I close this page with the words of Oscar Wilde. "Experience is the name everyone gives to their mistakes".